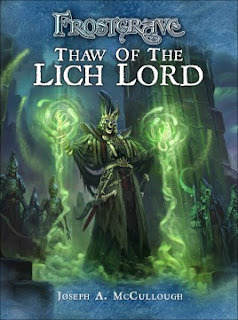 It is now just three days since the official release of Thaw of the Lich Lord, the first print supplement for Frostgrave: Fantasy Wargames in the Frozen City. I am excited to report that the book has already sold out in Europe, which means you can’t get it directly from Osprey or Amazon at the moment. That said, it should not be too hard to find a wargames dealer that has a copy if you want one. A second print run is inbound and should be here in a few weeks. The main rulebook is currently on its fourth print run, and, in total, has sold somewhere between 9,000 and 10,000 copies. While that doesn’t put it anywhere near ‘the big boys’, it is a very good number for a wargame. In fact, it makes it Osprey’s third best-selling wargame after Bolt Action and Field of Glory. Perhaps more amazing, there are now two plastic box sets of figures for the game, and over 30 different blister packs of metal or resin figures (most of which contain two figures each). There is also a printed deck of spell cards. Not everything has gone perfectly, however. A number of copies of the second print run of the book proved defective, which resulted in the spine cracking and pages falling out. Thankfully, this doesn't seem to have effected too many books, but if you have a book that is falling apart, please contact wargames@ospreypublishing.com and let them know. What does the future hold for Frostgrave? Well, the first half of next year, will see the release of two small, digital-only supplements: Sellsword and Dark Alchemy. For those that are wondering, why Osprey is releasing new material this way – well, that is mostly my fault. As soon as Osprey realized the game was a hit, I was asked to write more material. However, the result of having a full-time job and a full-time baby daughter is that I only have so much writing time. I said there was no way I could work another full supplement into my schedule…however, I could do some smaller ones. For those, like me, who much prefer print of digital, I can say that the plan is to collect these smaller releases into a print companion in the future. July next year will see the release of the next print supplement with Into the Breeding Pits, which I've talked a bit about in a previous blog. One of the most common requests I have received from fans of Frostgrave is for some kind of ‘captain’ to help lead their warbands. Thankfully, this is something I also wanted for the game. Sellsword presents new rules for hiring captains, a soldier who can choose his own weapons and armour, who can gain experience up to a limit, and who can learn ‘tricks of the trade’. (Not exactly skills, you see, but I’ll leave that discussion for another day). Of course, captains want a bit more than the mere retainer paid to other soldiers… Sellsword will also include three new scenarios, all of which have some sort of magical ‘limitation’ in them, so that wizards have to rely a bit more on their soldiers in those situations. The focus of Frostgrave has always been about the wizards, and that is not something I want to change. Most soldiers will always be ‘extras’ as far as the rules are concerned. But the idea of a wizard having a trusted swordsman friend is just too good for me to ignore. Hopefully players will find the little bit of added complexity a worthwhile trade off. I won’t say too much about Dark Alchemy at this point, except that it will focus on potions, scrolls, and grimoires. I have never been completely happy with the rules for these magical treasures, and with a lot more time to think about them and hearing a lot of people voicing various opinions, I think this will be a good opportunity to review and tweak those rules, as well as introducing a lot of fun new magical items!